Tags provide a way to group related forms together, making it easier to organize your forms and find what you are looking for. See here for more about tags, including examples and best practices. Important Note: This article is about manually adding and removing tags. If you want to set up automatic form tagging, see here to learn more about auto-tagging forms using Workflows. In the Forms Tab, select Add Tags from the [...] Actions dropdown next to your form. In the Web Form Editor, click the Tags icon in the left sidebar. The Tags Window will open. The left side of the window contains a list of all tags available in your account, along with a text area for adding new ones. The right side of the window has a list of all tags currently assigned to this form. To add a tag to this form, just click the name of the tag on the left side, and you’ll see it added on the right side. To create a new tag and add it to this form, type it into the text area at the top and click the + button. The tag will be added to both sides of the window. To remove a tag from the form, just click the X icon next to the tag on the right side. The tag will remain available on the left side. 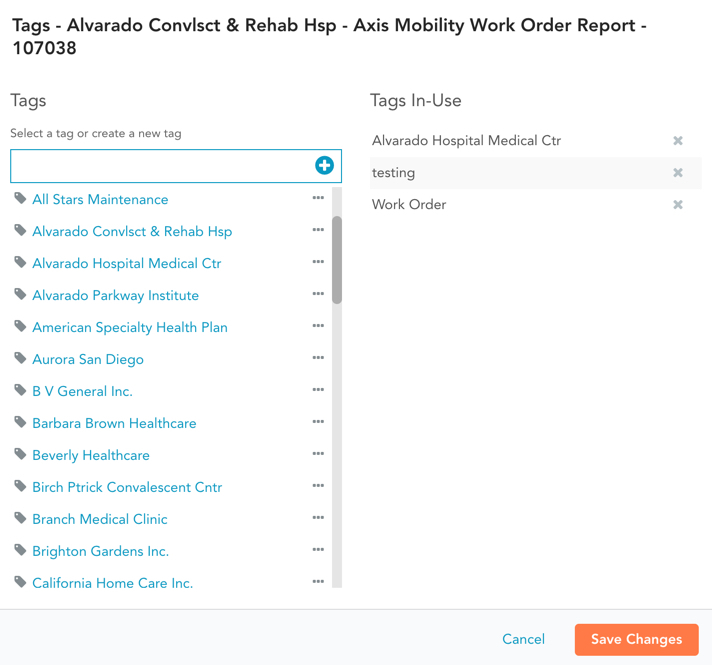 In the example above, the form has 3 tags: "Alvarado Hospital Medical Ctr", "testing" and "Work Order". When you are done adding/removing tags, click Save Changes to save your tags and close the Tags Window. Expand the [...] Actions menu on either the Forms List or the Form Viewer/Editor. On some mobile platforms you will see a Tags option here, while on others you will need to select the Details & History option to view the Form Details screen, and a Tags option will be available there. 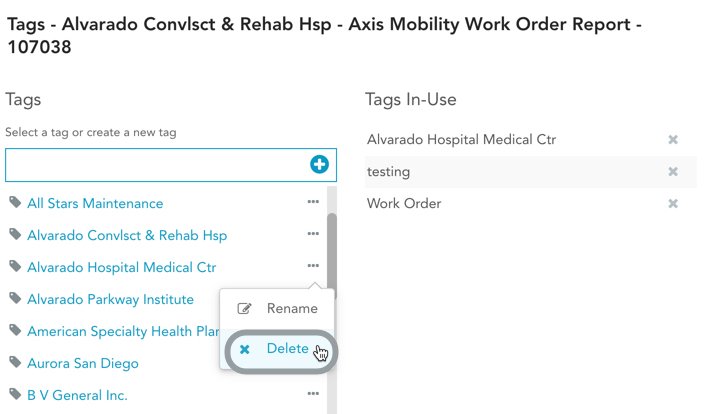 Once the Tags option is selected, you will see a list of the tags already assigned to the form, and see controls allowing you to add/remove tags from this list. For details on how to add/remove tags on your specific mobile platform, refer to our Mobile App User Guide. Delete: This will delete the tag from your account. The tag will be removed from any forms currently tagged with it. Deleting a tag is very different from simply removing it from a form. A deleted tag is completely erased from the account, which means that it is removed from all forms and no longer appears on any tag lists, such as the one in the filter area of the Forms Tab. You may want to delete a tag from your account if you created the tag in error, or if the tag has outlived its usefulness. Rename: This will bring up a Rename Tag dialog. Type your new tag name in this dialog, then click Ok. The tag will be renamed in the tag list as well as on all forms to which it is already assigned. When you are done managing tags, click Save Changes to close the Tags Window.